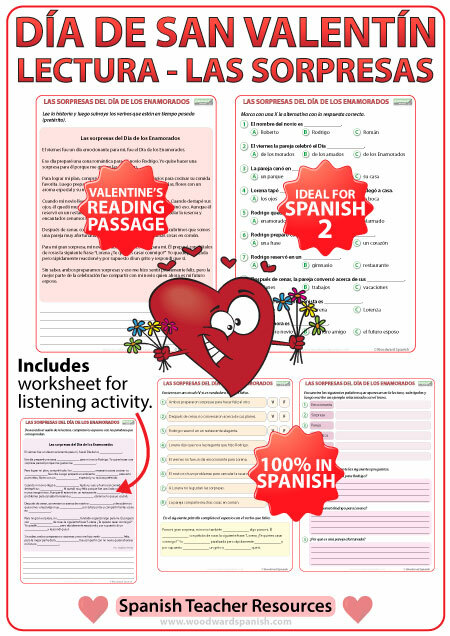 Reading Text in Spanish about Valentine’s Day with comprehension questions. 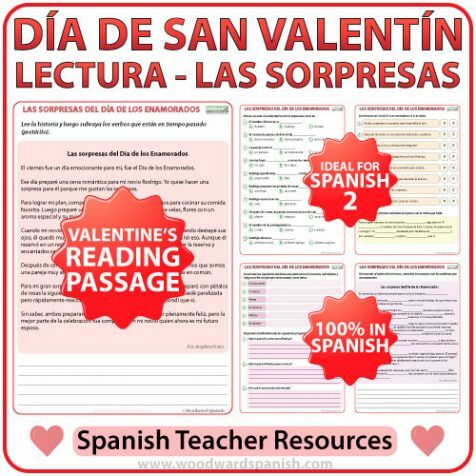 A Reading Passage in Spanish about the surprises a couple had for each other on Valentine’s Day. The text is in the past tense (pretérito) and includes comprehension questions. The reading text, questions and instructions are 100% in Spanish making it ideal for all nationalities learning the Spanish language. We have now included this story on another page, this time with certain words missing and replaced by a blank line where students can fill in the word they hear from our recording. This recording is in a video on our YouTube channel so students can listen to the stories in Spanish in the classroom or at home. Note: The audio of the listening only appears on our YouTube channel. The recording is spoken by a native Spanish speaker. Here is the audio that accompanies this story. It will also give you an idea of the content and level of the reading passages. Una lectura acerca de las sorpresas que una pareja hizo el uno al otro en el Día de San Valentín (Día de los Enamorados).